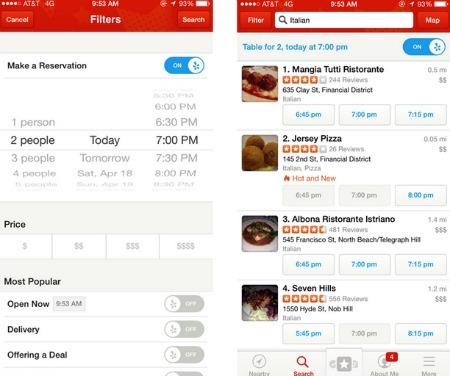 Yelp recently introduced a new feature called Yelp Now, which provides users with a new way to search the Yelp platform and take actions such as reserve a table or place an order for takeout or delivery. Through the new feature, users are able to filter search results to show businesses with reservations available that meet specific criteria, such as date, time, party size or specific type of cuisine. The new feature also enables users to search for restaurants that deliver to their home or office any time of the day. According to Yelp, restaurant reservations and deliveries are just the beginning for its new feature, as the company plans to eventually enable Yelp Now to search across other verticals like spas, hotels and plumbers to easily book available appointments, rooms and more. It is important to note, however, that Yelp Now is being released in a staged rollout for reservations and food ordering in select U.S. cities and will be scaled more broadly in the coming months. “Need a reservation for two at a romantic Italian restaurant for 7pm on Friday night? Craving a pepperoni pizza at 2am, but don’t want to leave your couch (or put on pants)? With Yelp Now, we’ll answer those questions for you, and get you from searching to eating faster than ever before,” Yelp states in its announcement.